it hits the floor and its mine!! (Skylar): Everything, I am not picky at all. (McTavish): Whatever my sisters are having!! she is such a whiny little girl and my ears start aching from listening to her!! until she pounces on me to get it back!! It is not fair, she is bigger than I am!! I dont know why people call me whiny. (Skylar): Rope yarn and anything Skeeter is playing with!! (McTavish): I have too many to pick from...but whatever Skeeter has is fine with me!! Favorite activity: (Smidgen): Going for a walk!! Second, is playing in the backyard with Skeeter. I love to chase all the squirrels, toads and chameleons. If I cant find any of them, Skeeter is a good substitute. We chase each other all over the yard. Skeeter is quick, but I have more endurance. I dont know why everyone laughs so much when they see us playing!! (Skeeter): Going for a walk!! Second, is playing in the backyard with Smidgen. I love to chase all the squirrels, toads and chameleons. If I cant find any of them, Smidgen makes a good substitute. We chase each other all over the yard. I am as agile as a cat but Smidgen does a good job of keeping up with me. Sometimes she even outlasts me and wont quit pouncing on me! (Skylar): Playing in the yard and chasing after falling leaves. Next is playing with my sisters. (McTavish): Roughhousing with Smidgen, tugging toys with Skeeter and playing chase with Skylar. I am just starting to zoom too. Nothing more fun than a four dog zoom race!! according to my mom. Holding down the Rose of Sharon branches so Skeeter can pull the blossoms off. I also conveniently remember how to roll over as soon as I see a treat come out. Hey, I dont work for free!! My Mom thinks I have the most happy-go-lucky, sweetest personality in the whole world. Aw shucks, I am blushing!! (Skeeter): Most piercing bark in the world. Hey, I want to be HEARD. My dad says that I am a great dancer and who am I to disagree. Its a great attention grabber and I always get a long backrub out of it. I am most proud of my temporary position as Smidgens physical trainer. Thanks to my encouragement (she says aggravation), her leg is normal and I regained my best buddy and constant playmate. (Skylar): Being the best behaved and sweetest rescue in the whole world!! (McTavish): Cutest puppy in the world...according to my sister and mom!! Most embarrassing moment: (Smidgen): Using the Holly bush as a slide to reach the patio. Whew, that was a close call. When I was just a pup, I liked to crawl into my water bowl too. Besides not fitting anymore, I am much too dignified now. (Skeeter): I fell into the hot tub and my mom had to rescue me. Dog paddle? What is that? My Mom constantly embarrasses me when she tells people how sweet and loving I am. Hey Mom, I am not Smidgen. I was born to irritate people. (McTavish): Getting my head stuck in the gate!! At least mom didn't take a picture of it!! I am much more careful about jumping now. (Skeeter): I was constantly in trouble as a puppy. Its not my fault, its the genes. I cant help it that Smidgen got all the happy-go-lucky personality. Pillows and beds are just made to chew on. All that fluff looks so pretty floating around the room. Yuck, it doesnt taste very good. Everybody forgets that angelic Smidgen shared many a bout of destruction right along with me. She just conveniently left the area after the deed was done. I stayed around to take the credit. (Skylar): Getting picked up by the Animal Shelter. even though she is my sister. Mom thinks we play together like little bear cubs. Sometimes Skeeter gets a little obnoxious and I have to put her in her place. (Skeeter): Smidgen is my best friend in the whole world. Sometimes, I get tired of her namby pamby ways. She sure is fun to play with though and those ear massages cant be beat!! 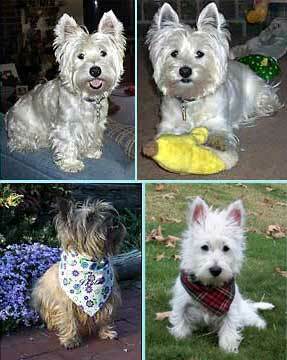 Skylar): Smidgen and Skeeter, my Westie sisters. (McTavish): Smidgen, Skeeter and Skylar. Biggest adventure: Driving eight hours from Tennessee to our new home in Arkansas. We dont remember much because we slept most of the way. We know that our older sister, Widgit, wanted to drop us off along the highway or at least sell us at the nearest roadside stop. (Skylar): Coming to live in a strange house with two new Westie sisters. (McTavish): Going To Doggie Fun Zone in Memphis.